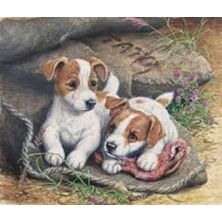 JHG Jigsaw Ltd (James Hamilton Grovely) is a puzzle manufacturer in Dorset, England. A farm was converted to become manufacturing premises for jigsaw puzzles. JHG jigsaw puzzles are made from materials that are as eco-friendly as possible so the puzzle board and boxes are made from recycled card, the printing paper is FSC certified and the glue is starch based.